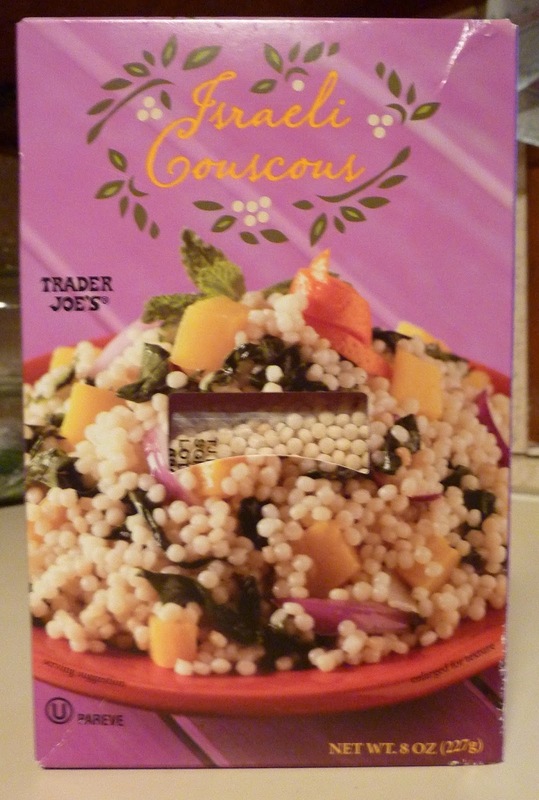 Prior to spying this box on the shelves of a local TJ's, I wasn't aware of the existence of Israeli couscous. Regular couscous, yes. But I didn't know this other special version existed. Otherwise known as "pearl couscous" for it's shiny, spherical form, this type of couscous is popular in—you guessed it—Israel, where it is known as "ptitim." And since I'm fond of celebrating my 1/16th or so Jewishness, as I've mentioned before, I decided this inexpensive box ($2) of grain/pasta was a suitable selection for my next misadventure in foodie-hackery. I was about to heat up the saucepan on the stove top when Sonia stopped me and encouraged me to go tend to our animal friends while she did the cooking. I'm pretty sure that's a subtle commentary on my culinary abilities, but she insisted that she just felt like cooking. And wow. Not only did she cook the couscous properly with a bit of olive oil, but she made a whole lovely Mediterranean-themed meal, complete with cucumber salad, hummus, and meat, as shown in the pic to the right. Strangely, I enjoyed this "Ben-Gurion rice" significantly more than any normal couscous I'd ever had, while Sonia expressed the reverse. I liked the larger size, chewier texture, and lightly nutty flavor of these, while I've always felt as if regular couscous were just a notch above seasoned sawdust. Sonia just prefers her couscous smaller and less chewy I guess. Or maybe she's just not as in touch with her inner-Jew. It's cheap, shelf-stable, kosher, vegetarian, and relatively high in fiber. It's most definitely not gluten-free...and it's not exactly a party food by itself. But it goes great with vegetables, hummus, fish, or poultry. If you're looking for a wheat-based alternative to rice or regular couscous, I've gotta say, I'm a fan. Four stars from me. Three from Sonia. My husband cooks up Israeli couscous with chopped peppers and pine nuts. So yummy! I happened to have a box of this and made a salad with golden raisins, pistachios, and goat cheese. Try toasting the couscous with olive oil a little salt and chopped garlic for a few minutes and then adding chicken broth instead of water. Gives it so much flavor. I like cooking it with chopped up sausages or minced meat and spices. Very good in soups or made as a salad! I was so disappointed to see that TJ's has replaced their instant couscous with this. It was the only place in my town I could get the unflavored instant. I had not eaten couscous in ages, but discovered a box of Whole Wheat Trader Joe's couscous at a petsit (as I eat whatever food is in the cabinets). 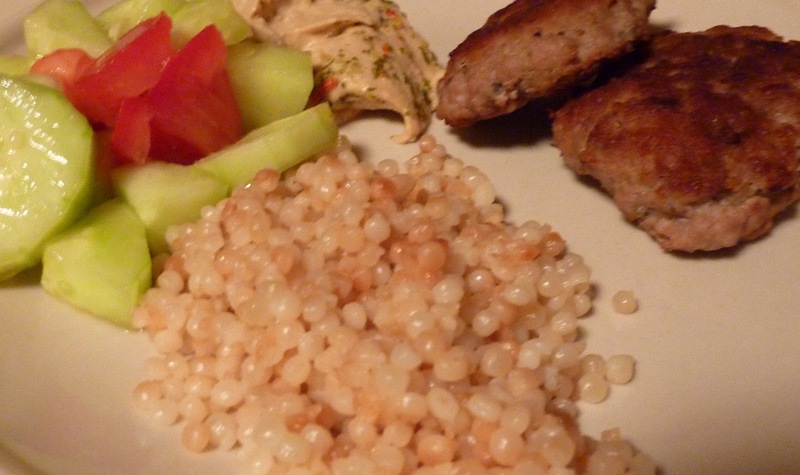 It was extraordinairly easy to whip up - pouring boiling water into the couscous, and voila! A healthy grain to eat with whatever else I cooked up. It's particularly handy when you do not have a stove or oven to cook on - which occurs when we stay at my husband's office in between petsits - that has neither, but does have a kitchen with a electric kettle.